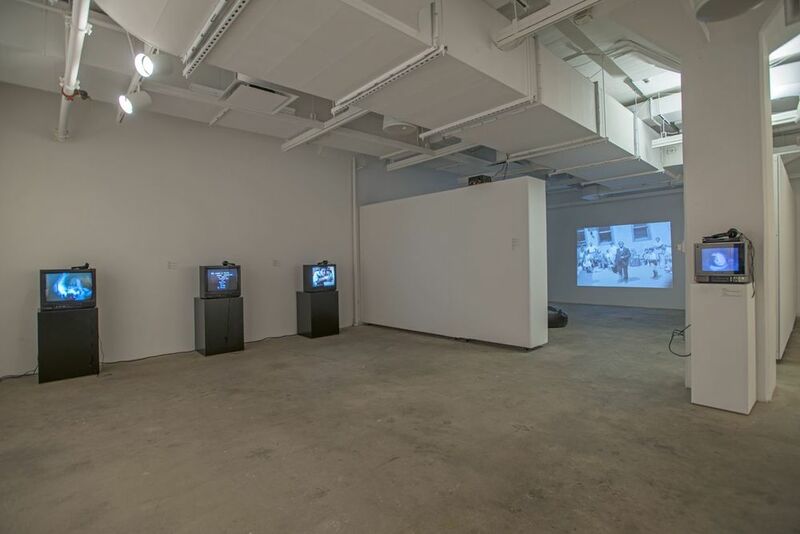 Installation view: The Experimental Television Center: A History, Etc..., Hunter College Art Galleries, 2015. Photo by Bill Orcutt. Curated by Sarah Watson, Chief Curator of the Hunter College Art Galleries, Timothy Murray, Curator of the Rose Golden Archive of New Media Art, and Sherry Miller Hocking, Assistant Director of the Experimental Television Center. For over forty years, the Experimental Television Center was one of North America’s preeminent organizations for video art. The Center fostered a community for creativity and innovation through its residency program and tool building research program. This groundbreaking exhibition documents the important role the Experimental Television Center played in the development of video as an artistic medium. The exhibition presents a virtually invisible, but vitally important, aspect of the history of video art, one marked by collaboration, hacker-technology, and artistic liberation. The Experimental Television Center: A History, ETC... marks the first academic survey of the Center’s prolific, yet under recognized, role in the evolution of video art. Divided into two parts, the show maps the ETC’s history and importance within the larger narrative of the development of video art in New York State, the United States, and beyond. Part I: A History examines the early years of the Experimental Television Center through ephemera, tools, and early works from the late 1960s through the 1970s. Part II: ETC... looks at the growth of the Experimental Television Center from the 1970s through 2000s and its influence on the trajectory of video art into the digital and internet age. The Experimental Television Center, founded in 1971 by Ralph Hocking, developed out of the media-access organization Student Experiments in Television (SET), which Hocking, a professor at Binghamton University (New York), started on campus in 1969. Established during the advent of portable video tools such as the Sony Portapak, SET provided equipment to community groups, students, artists, and faculty. As the interest in video grew, Hocking recognized the potential that video equipment held for artists. With encouragement from the pioneering video artist Nam June Paik and support from the New York State Council for the Arts, Hocking moved the organization to downtown Binghamton. In 1980, the Center moved to Owego, New York, where it was located until it closed in 2011. The ETC focused on providing access to and training on this new technology to three major communities: artists; social, cultural, and educational organizations; and interested citizens. Invested in the artistic possibilities of video, the ETC developed a research program to push the boundaries of the medium by creating a more flexible set of processing tools for artists. One of the earliest machines built at the ETC was the Paik/Abe video synthesizer. Under the direction of Nam June Paik and Shuya Abe, the first synthesizer was constructed for the TV Lab at WNET-TV in New York, followed by a second one for permanent placement at the ETC. The arrival of the Paik/Abe synthesizer launched the Center’s artist’s residency program. Some of the earliest artists to participate in the residency were Shigeko Kubota, Nam June Paik, Hollis Frampton, Bill T. Jones, Jackson MacLow, Nicolas Ray, Walter Wright, and Arnie Zane. For decades, the ETC served as a site for exploration, education, and practice for media artists. From 1971 to 2011, over 1,500 artists participated in their residency program. In addition to the artists listed above, the residency also hosted the artists Irit Batsry, Peer Bode, Nancy Buchanan, Benton Bainbridge, Barbara Buckner, Shalom Gorewitz, Alex Hahn, Barbara Hammer, Gary Hill, LoVid, Kristin Lucas, Darrin Martin, Marisa Olson, and Alan Sondheim, to name just a few. Although the Center closed its physical space in 2011, the philosophy and ethos of the ETC endures through its ongoing commitment to the education, research and preservation of the media. One of the ETC’s most significant contributions to this work is its comprehensive archive. The archive is now housed at Cornell University, in the Rose Goldsen Archive of New Media Art, where it is being digitized, preserved, and made available for research. This exhibition is presented by the Hunter College Art Galleries in collaboration with the Rose Goldsen Archive of New Media Art, Cornell Library. The Experimental Television Center: A History, Etc... is made possible by the generous support of The Hunter Art Exhibition Fund; Foundation To Life, Inc.; The Arts Across the Curriculum Initiative at Hunter College, funded by the Andrew W. Mellon Foundation; the Rose Goldsen Archive of New Media Art and the Digitization and Conservation Services, Cornell Library; Society for the Humanities, Cornell University; the Experimental Television Center; New York State Council for the Humanities; Electronic Arts Intermix; Dave Jones Design; and Signal Culture.